The ADCDS-1801 is an 18-bit, industry-leading, integrated solution for CCD Signal Processing. This series of analog front-end imaging converters are designed specifically for the very high-resolution imaging applications. 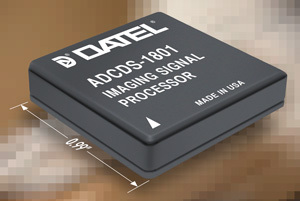 DATEL, Inc. has announced the introduction of the ADCDS-1801 Series, a new line of analog front-end converters for imaging applications that use area-CCD array detectors. The ADCDS-1801 incorporates a user configurable input amplifier, a low noise correlated double sampler (CDS) and an 18-bit resolution sampling A/D converter in a single package. This provides the user with a complete, high performance, low-cost, low-power, integrated solution. The key to the ADCDS-1801's performance is a unique, high-speed, high-accuracy CDS circuit, which eliminates the effects of residual charge, charge injection and "kT/C" noise on the CCD's output floating capacitor, producing the pixel's output signal. The ADCDS-1801 digitizes this resultant pixel signal using a high-speed, low-noise sampling A/D converter. At 31µV of RMS noise, the ADCDS-1801 is the best choice for all high resolution imaging application. The ADCDS-1801 is offered in a small 44-pin SMT plastic package as a commercial grade (0 to +70C) or extended temperature grade (-40 to +100C). It features gain adjust, offset adjust, a precision +2.048V reference, a user selectable OVDD supply voltage range of 2.5V, to 3.3V, and a programmable analog bandwidth function.